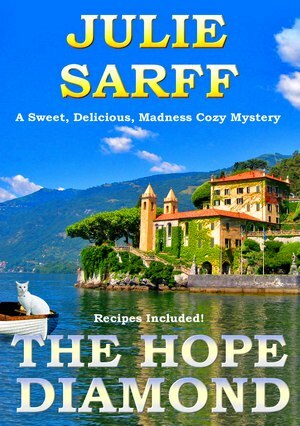 The Hope Diamond is a delectable mystery with recipes! Lily Bilbury needs to find the remnants of the French Blue and find them fast. It’s been three long years since her Italian husband cheated on her, and she is facing financial ruin. In desperation, she teams up with fellow housemaid, Francesca -- an irascible Italian fashionista and self-proclaimed psychic. Together they search Villa Buschi for some of the most famous gems in the world, the diamonds that were cut away from the French Blue to make the infamous Hope. 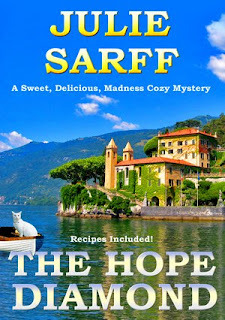 But when Lily can’t find the diamonds, and nothing seems to go her way, she briefly contemplates running around ranting drivel and frightening the whole reserved population of Arona, Italy. Follow Lily and several rambunctious rescues kittens on her quest for precious antiquities; a journey which may lead to something far better than long lost gems.